Frankie: [shows Johnny a scar on her neck] The man I was with... he did this with a belt buckle. He's the reason I can't have kids. He, uh... he knocked me around while I was... pregnant. Frankie: I lost the baby. Johnny: [gently kisses the scar] It's gone. Frankie: It'll never be gone. Very pleasant love-story that wouldn't have been this good without the great performances by Pacino and Pfeiffer. 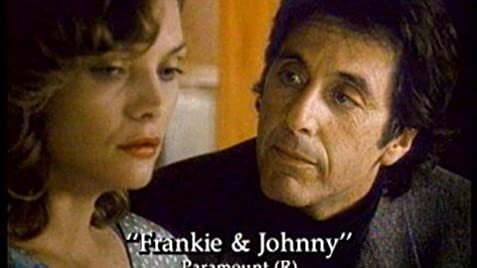 Pacino is the cook with the romantic heart who just got out of jail (of course he wasn't a real criminal) starts working in a Greek restaurant and falls in love with Pfeiffer, the waitress, who just wants to watch videos and eat pizza after a few bad love-experiences. Pacino has to do a lot (read Romeo & Juliet, dance like a madman, chop vegetables and be very patient) to win her love and is finally helped by the sound of Debussy's 'Claire de Lune'.